Your real estate taxes for 2019 will be collected by the Chester County Treasurer per our agreement with them. The millage rate for real estate taxes is unchanged at .75 (¾) mills. Tax bills are mailed the week of February 1st to the property owner’s address of record. For questions, call the office of the Treasurer of Chester County at 610-344-6370, fax to (610) 344-6359, go to website www.chesco.org/treasurer or email TreasurerDept@chesco.org. Earned Income Taxes (EIT) and Local Services Taxes (LST) are collected by the Keystone Collections Group. They can be reached at 866-539-1100 or go to their website at www.keystonecollects.com. Charlestown Township’s Earned Income Tax is 1% for residents. The rate for non-residents is ½%. The Local Services Tax is $52.00 per year and your Charlestown Township employer is required to deduct an even proportion from each paycheck throughout the year. Persons earning under $12,000 per year are exempt. At the January 3, 2012 Board of Supervisors meeting, the Board adopted Ordinance #177-2012 repealing the $10.00 Per Capita Tax that was paid annually by all residents over 18 years of age. You will not be getting a Per Capita Tax bill this year or in the future. 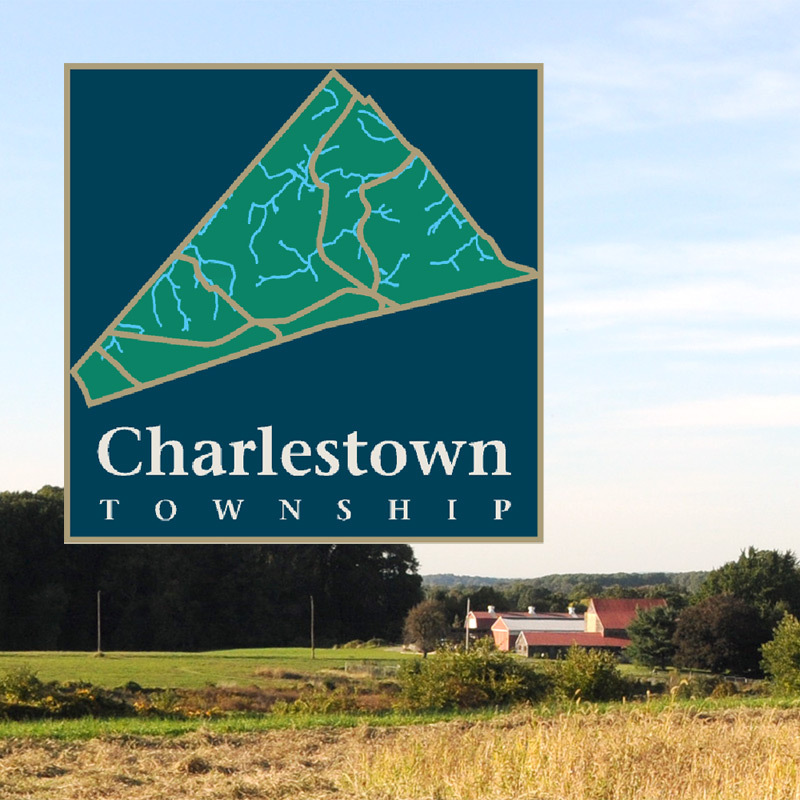 The Real Estate Tax Bills for Charlestown Township are mailed out each year in late January/early February by the Chester County Treasurer’s office. The millage rate for real estate taxes is .75 (¾) mills. What is the real estate millage for 2019? .75 mils, which is .00075 multiplied by your assessment value. What is the per capita tax rate for 2019? It’s Zero! The Board of Supervisors repealed the Per Capita Tax by ordinance on Jan. 3, 2012. You will no longer receive a bill for this tax. The real estate bill used to go directly to my mortgage company. Did they get a copy? No. By law the tax bill must go to the tax payer on record with the County Assessment Office. If you have funds escrowed with a mortgage company to pay your taxes, you must send them your real estate bill. We recommend you make a copy for yourself first. How do I order a real estate tax certification, or what if I have other real estate tax questions? Call the office of the Chester County Treasurer (610) 344-6370 or email TreasurerDept@chesco.org. All individuals employed within Charlestown Township whose total earnings and net profits from all sources exceed $12,000 for the calendar year in which the local services tax is levied and who do not qualify for one of the exemptions. Sole proprietors, partners, and other types of business owners are subject to the LST. Can an individual’s total annual LST liability exceed $52? Is the $12,000 low income exemption mandatory? Each political subdivision that levies a LST at a rate exceeding $10 is required to exempt persons whose total earned income and net profits from all sources within the political subdivision are less than $12,000 for the calendar year in which the LST is levied. Should employers withhold the tax from employees who earn less than the $12,000 low income exemption? Not if the employee files an upfront exemption certificate with both the employer and the municipality affirming that he or she reasonably expects to earn less than $12,000 during the calendar year for which the exemption certificate is filed. What happens if the income of an individual who filed an upfront exemption certificate exceeds $12,000 during the calendar year? If that individual’s earned income and net profits from the primary employer exceeds $12,000 or the municipality’s tax collector informs the employer that the employee’s income has reached $12,000, employers "restart" withholding of the LST by withholding a "catch up" lump sum tax equal to the amount of tax that was not withheld from the employee as a result of the exemption. Subsequent withholdings should equal the same amount per payroll period that is withheld from other employees who did not file an upfront exemption. What other exemptions are provided? In addition to the low income exemption, exemptions are provided for individuals who are secondarily employed and whose primary employer is withholding the $52 annual tax liability, for members of a reserve component of the armed forces during anytime he or she is called to active duty (not inclusive of annual training requirement), and to honorably discharged veterans who served in any war or armed conflict who are blind, paraplegic, a double or quadruple amputee as a result of military service, or who are 100% disabled from a service-connected disability. For the purposes of this act, reserve component of the armed forces shall mean United States Army Reserve, United States Navy Reserve, United States Marine Corps Reserve, United States Coast Guard Reserve, United States Air Force Reserve, Pennsylvania Army National Guard, or the Pennsylvania Air National Guard. Are employers required to deduct the tax weekly? Employers must withhold the tax based on their number of annual payroll periods and are prohibited from withholding the tax in a lump-sum payment. Therefore, if an employer pays its employees weekly, the tax must be withheld weekly. If an employer pays its employees biweekly, the tax must be withheld biweekly. What if an individual is self-employed and does not have a regular payroll period? The tax should be pro-rated and paid by self-employed individuals on a quarterly basis, as if their payroll period is a calendar quarter. Self-employed taxpayers shall pay the tax to the municipality 30 days after the end of each calendar quarter. What if an employee works in more than one municipality that levies the local services tax in the amount of $52? How often are employers required to submit tax revenues to the municipal tax collector? What happens if an employee resigns? Must the employer try to collect the tax from the former employee for the remainder of the year? No. The employee is now liable for the tax. If an employee quits, his or her previous employer only needs to withhold the tax for the payroll periods in which the former employee was employed. The former employee’s new employer will be responsible for withholding the tax from future paychecks. What if I have other Local Services Tax questions? Call Keystone Collections toll free at (866) 539-1100. Forms are available at www.keystonecollects.com. What is the Earned Income Tax Rate for 2019? For Charlestown residents, the rate is 1%. For non-residents, the rate is ½%. The earned income tax has been levied by Charlestown Township by ordinance. Earned income is defined as salaries, wages, commissions, bonuses, incentive payments, fees, tips and/or other compensation for services rendered, whether in cash or property, and whether paid directly to you or through an agent. In addition, the net profits of a business are subject to a net profits tax. Net profits are defined as the net income from the operation of a business, profession, or other activity, except corporations, after deductions for all operating costs and expenses incurred in conducting said business. Income such as dividends, interest, income from trusts, bonds, insurance and stocks is exempt. Also exempt are payments for third party sick or disability benefits, old age benefits, retirement pay, pensions – including social security payments, public assistance or unemployment compensation payments made by any governmental agency, and any wages or compensation paid by the United States for active service in the armed forces of the United States including bonuses or additional compensation for such service. If The Tax Is Withheld In Another Community Where I Work, Which community gets the tax, the one where I work or the one where I live? The tax withheld by your employer will be remitted first to your resident taxing jurisdiction. If the tax in the community where you work is higher, they will receive the difference. All those who both reside and work in Pennsylvania. If they are following the requirements of Act 32 of 2008, all PA employers are required to withhold earned income tax and remit it quarterly. The earned income tax will be collected directly from those who are: 1) self-employed; 2) salaried but self-employed in a side business; or 3) work in a municipality where the tax is not in place, or out of state. Those persons must file a quarterly income tax return form. Yes. A Local Earned Income Tax Return must be filed annually by April 15th. What if I’m retired, or otherwise don’t have any earned income? Do I have to file a return? No. However, if you paid the tax in the past, or you receive tax forms for the current tax period, we recommend you simply write on the form that you have no earned income to report and return it to the tax collector. What if I have other Earned Income Tax questions? Call Keystone Collections toll free at 866-539-1100. Forms are available at www.keystonecollects.com. All Charlestown properties are located within Chester County. Tax bills are mailed out in January. All Charlestown properties are located within the Great Valley School District. Tax bills are mailed out in July. Tax bills will continue to be mailed directly to taxpayers. If a mortgage company or bank pays your real estate tax bill from an escrow account, you must forward your tax bill to them so they can pay on time.